Residential - Great Northern Elevator Co.
More and more homeowners, architects and builders are speccing them into drawings and designs in the early stages of planning. On the other side of things, people are staying in their homes longer and choosing to upgrade their homes by installing elevators and lifts. Great Northern Elevator pays close attention to all the details involved with the installation of a residential, or home elevator. Our residential elevator team has been installing, repairing, and maintaining residential elevators for many years, some of our mechanics have literally installed 100’s of the systems. We begin the planning stages early on with the architects and builders, it is imperative to get all the details correct the first time. We do periodic site visits to insure the home owner, and builders are getting the details correct to avoid any costly mishaps. Hoistways, pit depth, and overhead specifications are vital in the pre-planning stages, so call early and get your project started in the right fashion, our experts will be available to you and your team early on to help you achieve your goals and get everything started correctly. Visit our planning, and choosing your system links to begin your project. Residential Elevators are second nature at Great Northern Elevator. We have knowledgable, courteous experts that will help maintain your existing system or help you see a new project come to life. 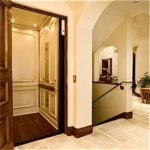 We install a host of the most reliable residential elevators using non proprietary, off the shelf parts available from several suppliers helping to keep your installation and maintenance costs low. Contact us to receive a quote for one of the most affordable residential elevators installed by certified and licensed elevator mechanics.